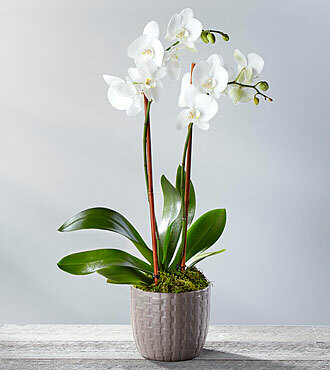 From the Old Testament to our modern era, flowers were often used by religions as powerful spiritual symbols. 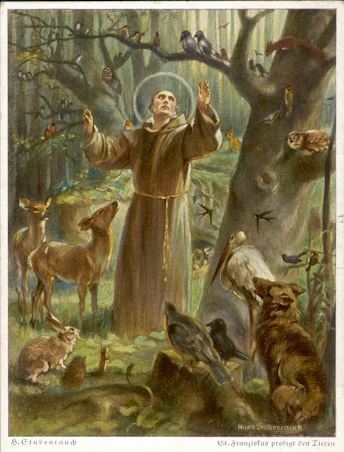 Plants and trees symbolize a Christian symbol or an icon, but can also be figures, characters or colours used to represent abstract ideas, concepts or images depicting an idea. 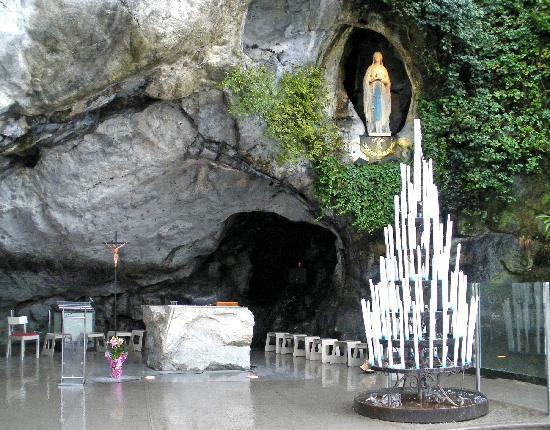 These religious icons as Christian symbols have a sacred significance. Flowers and plants perceive Christianity as God's creation to express and share with the people divine goodness, truth and beauty the aim of Creation. The Holy Trinity: Flowers which are separated into three parts; colors and leaves, are symbols of the mystery of the Trinity: Father, Son and the Holy Spirit. Three petals that compose a flower are associated with the Father, Son and Holy Spirit, but absolute metaphor for the trinity is Trifolium repens. What creates a unit is each section taken as an entity. Aquilegia spp., a multi segmented flower is known as the characteristic of the Holy Spirit. Another flower that has often been associated with the Holy Spirit is Strelitzia reginae (Bird of Paradise) especially because of its similarity with the bird. 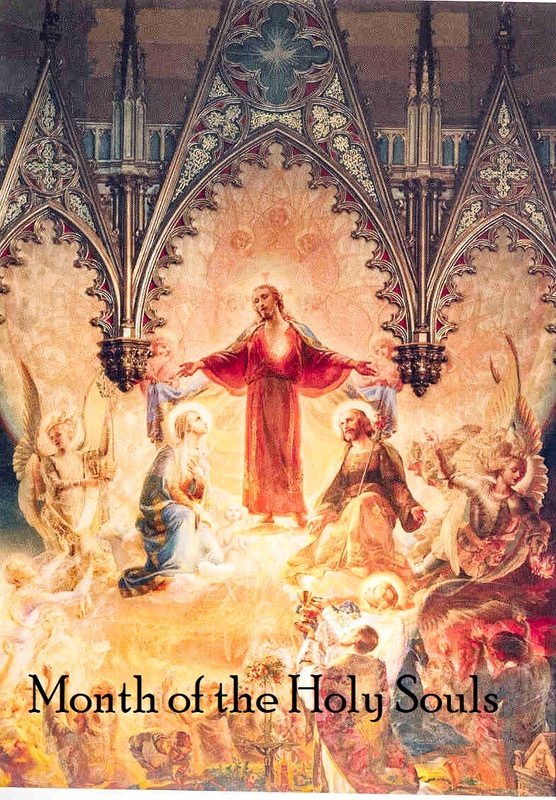 The Holy Spirit is also symbolized by white tulips and lilies with three petals, symbolize the Trinity and triple virtues of justice, charity and hope. Virgin Mary, Mother of God: Lilium candidum is the quintessential flower that represents innocence, virtue and purity. 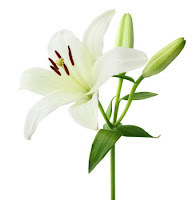 White lily was associated with the Virgin Mary since the early Christianity, a seeming legend from the second century, narrates that her grave was decorated with lilies after her Assumption into heaven. The petals of white lilies symbolize purity, virginity, bright and radiant soul of Virgin Mary. For centuries, painters have frequently shown a Virgin Mary around the mystic lily flower, over time Lilium became a Christian symbol of purity. This devotional painting determined illustrating other scenes of the Virgin Mary with Jesus, or with saints, also in gardens with lilies and other flowers (Fig. 2). Multitude of legends about roses, considered the "queen of flowers", symbolizing the Virgin Mary, took amplitude in the 12th century. For example, it says that when the Virgin Mary was announced by the Archangel Gabriel that she would become the mother of Jesus, Son of God, she blushed and Rosa Alba became pink. Protected by thorns, rose is a beautiful flower, representing beauty, secrets, life, blood, death and rebirth. Moreover, the rose is a messenger of divine and pure love, expressiveness, color, perfect shape and scent denotes the thorns role of Virgin. Mary in salvation history as the Mother of God, who agreed to be crowned with thorns, and shed His blood on the cross for His love for mankind. When in a flower arrangement a red rose and a one white are side by side, symbolizes the crucifixion and resurrection of Jesus Christ. In the fourteenth century the poet Dante called Mary "the Rose, in which the divine Word became flesh....” Many artists of the fifteenth century painted Mary with roses, often in a rose garden (Fig. 1). In Christianity flowers have a special place because remind of what Jesus did and the promises that he made. Flowers became common in religious and ceremonial uses for Christians by the fourth century, being used for weddings, name day, funerals, church decorations, different occasions, holydays and even cut. These flowers are found as described in the crucifixion scenes and have been associated with the sorrow of Virgin Mary, for the Passion of Christ, with death and worry. 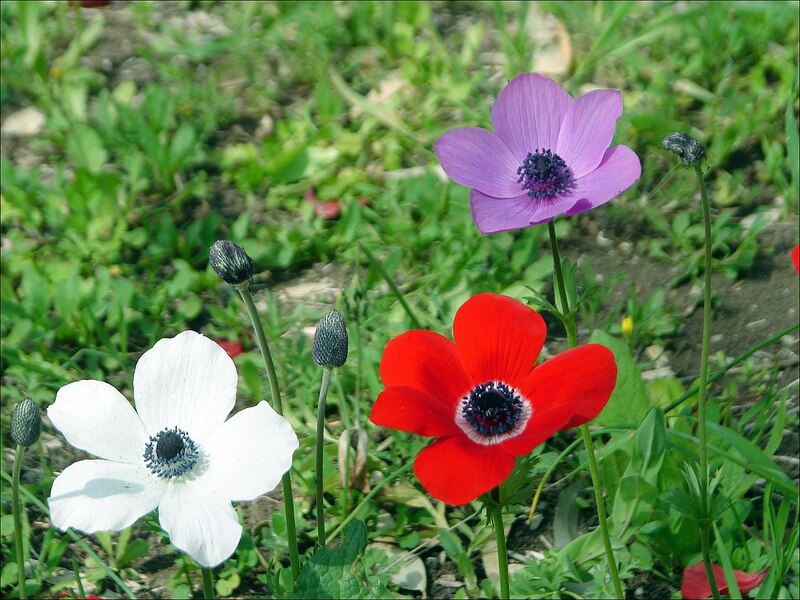 Anemones occurred on Golgotha where Jesus was to be crucified, so red spots on petals symbolize the bloodshed by Christ. At the beginning of the Church, anemones were used to symbolize the Holy Trinity. 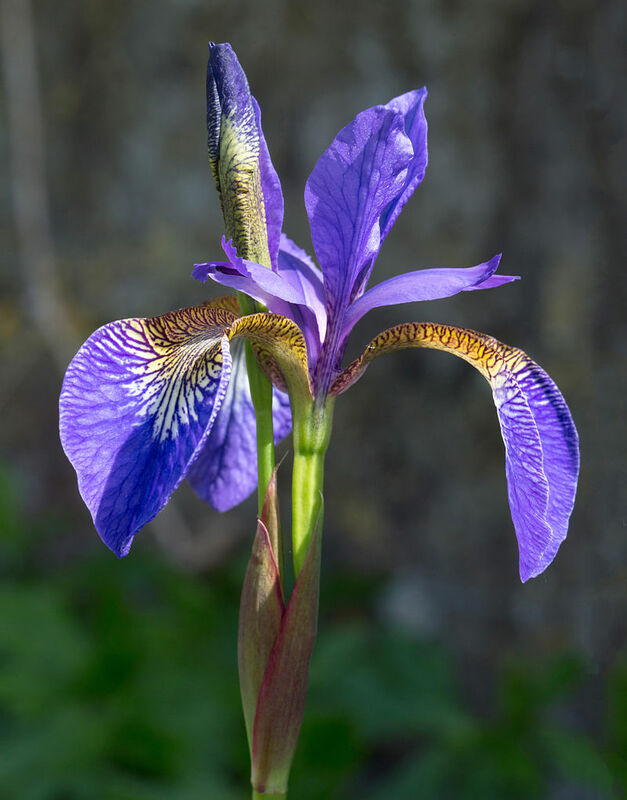 Iris is found in the works of Flemish masters, as a religious symbol, often called a rival of lily the flower of Virgin Mary. Iris appears in their paintings together with lily or replacing it. The symbolism of this flower comes from the fact of its sharp leaves as sword, was taken as an allusion that could riddle the soul of Virgin Mary and cause pain due to Christ's Passion. Spanish painters adopted iris as an attribute of Mary, the Queen of Heaven, symbol, of faith, hope, light, divine protection, wisdom and value. 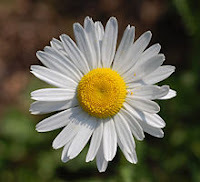 Daisies, flowers with an amazing simplicity, were used in Christian art paintings in the late 15th century, the symbolism of which is associated with is the Jesus’ innocence and candor. These flowers are associated with innocence, beauty, salvation, modesty, purity and love. Daisies represent also tears, blood, fear, death and perseverance. 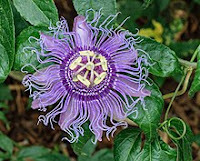 The flower is associated with the passion and the emblem of Jesus, flower known under different names such as Christ’s crown, Christ’s thorn or Christ’s bouquet. Due to the way of growth of this plant, it can be said that Passiflora need support, similar to how Christians need divine assistance. The plant grows easily back if it is cut, the same as those who have in their hearts the love of God to overcome evil in this world. 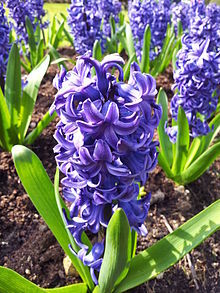 Hyacinth is considered as a symbol of Christian prudence, constancy, desire of heaven and peace of mind. Because this plant grows among rocks in solitary places, penance and humility is assigned as symbol. Hyacinth has purgative qualities, for which symbolizes innocence therefore Baptism. 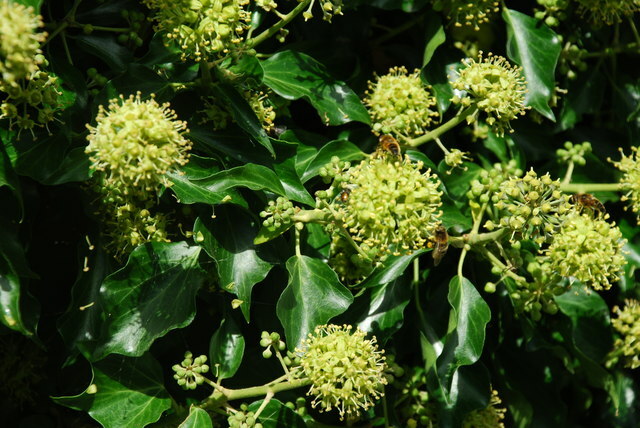 Ivy was always symbolically associated with death and immortality. Because it is all the time green has always been a symbol of eternal life and fidelity. The strong strain header cling to support, thus, the plant typifies immortal attachment and affection. These flowers remind of nails with which Jesus was crucified . 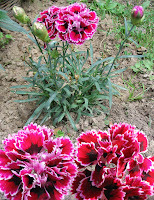 Red Carnation is associated with pure love, dedication and marital faithfulness. 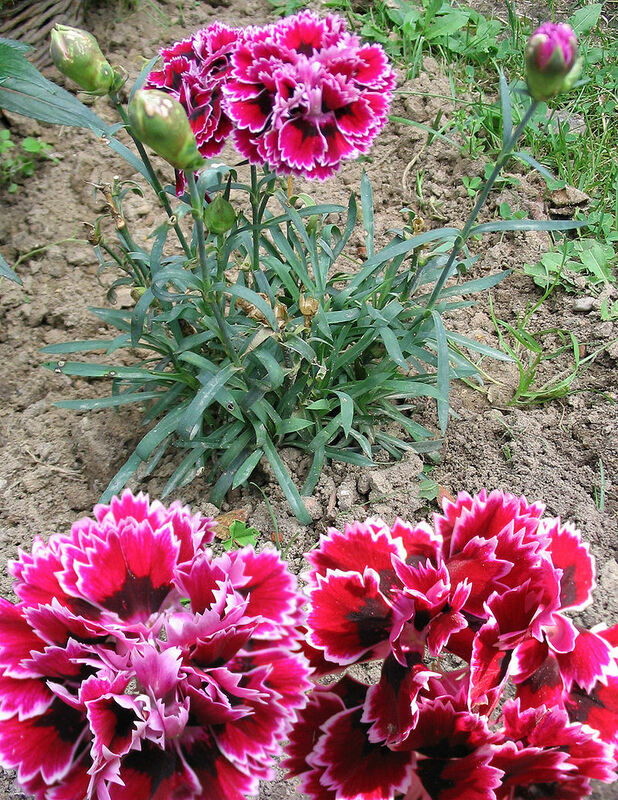 Christian legends assert that pink carnation appeared when Jesus Christ carried his cross on the path of pain. Virgin Mary grieved the torment of his son, crying, and from her tears that fell on earth sprang the first carnations. The name comes from the Latin word columba, which means dove. 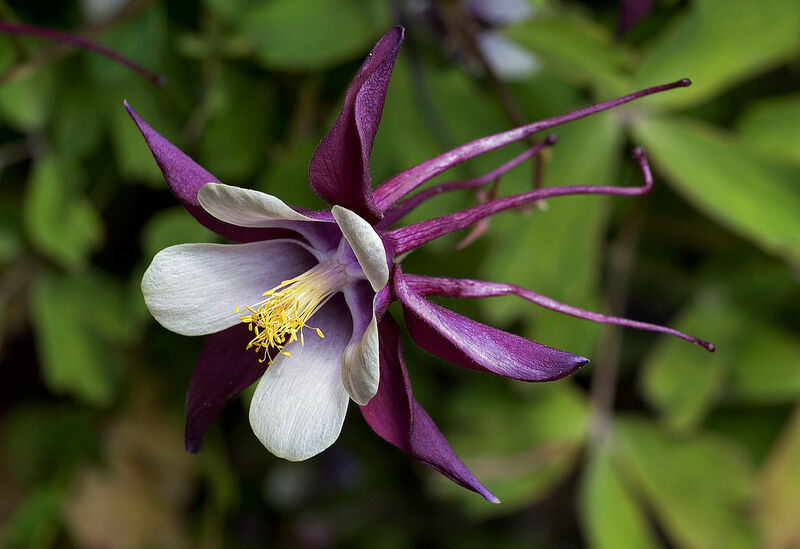 Also, this flower is compared with a dove, and, therefore, Columbine was used as a symbol of the Holy Spirit. Seven flowers on a stem symbolically represent the seven gifts of the Holy Spirit. Aquilegia is assigned with melancholy and suffering. Red rose is supposed to have been born of the blood of Christ and thereby is a sign of charity, martyrdom, and resurrection. 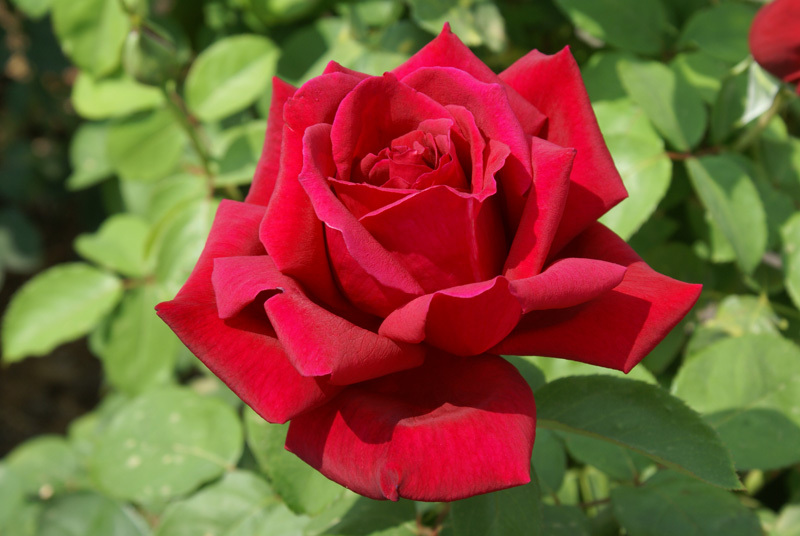 Red rose is linked with blood lost by Jesus when He was crucified on the cross and the Holy Grail - the vessel in which Joseph from Arimathea collected the blood of Christ. Related to this sacrifice of bloodshed, the rose becomes the symbol of mystical rebirth. Thus Mircea Eliade says that "human life must be consumed completely as to exhaust all the possibilities of creation and manifestation. Even abruptly interrupted by a violent death, she seeks to continue in a new form - plant, flower, and fruit “. 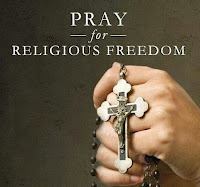 The name of Rosary (latin name Rosarium), which are strung beads used to keep note of prayers, derived also from the word rose. 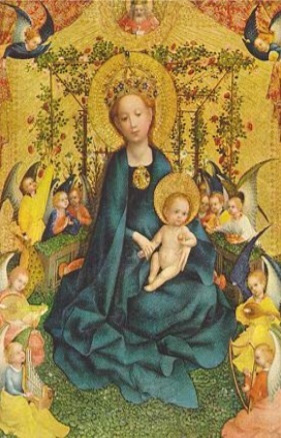 In Christianity are known three sizes: the small Rosarium which contains 33 small beads plus 5 large beads (meaning the age of Jesus and the 5 wounds of his), middle Rosary with 63 plus 7 (the age of Mary and the seven joys and pain) and large Rosary with 150 beads plus 15 (meaning the number of psalms). Lilium candidum or the white Madonna lily is the most recognized symbol for the Virgin Mary (Ferguson, 1975). The white petals represent Mary’s flesh and the yellow pollen covered stamens is her soul. According to Christian tradition lily was born from the tears of regret fallen of Eva when she left the Garden of Eden. 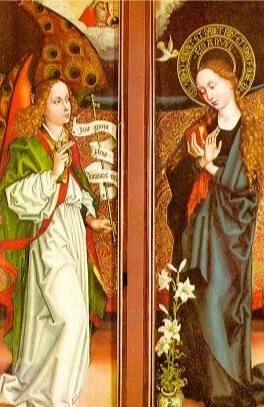 In Christian iconography, the lily is more associated with the Virgin Mary and with the Archangel Gabriel, being painted with a lily in his hand whiles the Annunciation, symbolizing chastity. Joseph is also sometimes painted with a bouquet of lilies bloom. Strain of lily symbolizes Mary religiosity; the leaves typify her humility, white petals the virginity, and perfume of lily divinity. The flower becomes an attribute of all saints. 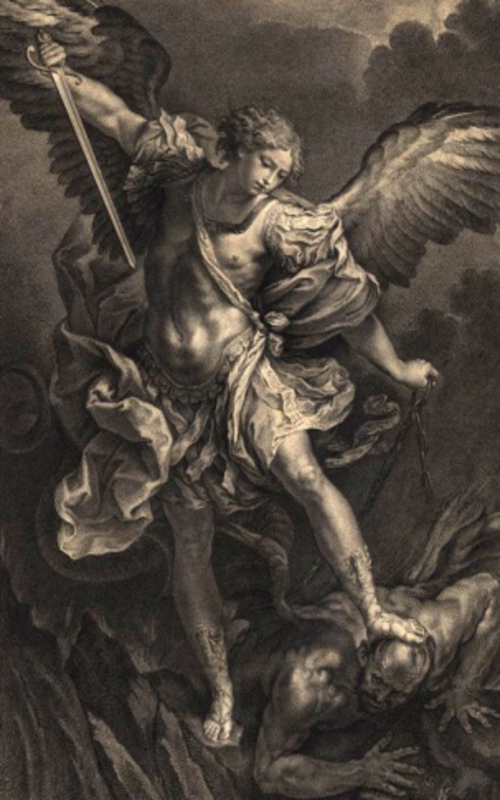 In some paintings Jesus is represented as judging the world with a lily in His mouth, in this case, the flower represents compassion, while a sword lily symbolizes innocence and guilt. Since the 11th century, the rose was also accepted as a symbol of Christianity, later gaining a new significance, largely due allegorical poem “The Divine Comedy” of Dante Aligheri. Rosa candida the white rose given by Beatrice to her beloved lover, and Rosa mystica - white rose of the Virgin Mary, both from the third part "Paradise" (as Hell and Purgatory) became a symbol of purity, innocence, and divine love, taken in religious iconography. The mystic white rose of heaven, the rose without thorns was a medieval symbol of virginity, purity, and devotion of Virgin Mary. In the middle Ages only virgins could wear the crown of white roses being a symbol of innocence. This beautiful flower was dedicated to Virgin Mary. Red stains in the center of the flower symbolize the pain of Immaculate Heart of Virgin Mary. 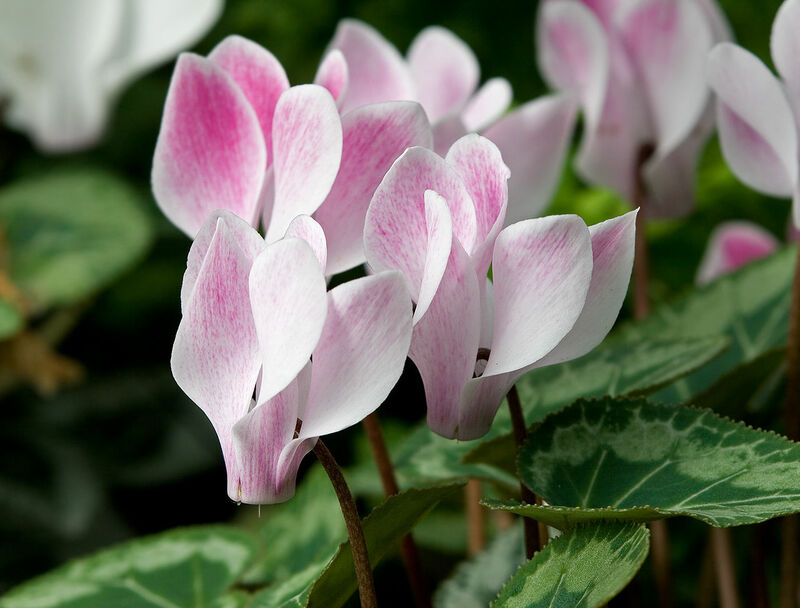 Cyclamen is sometimes called "bleeding nun". 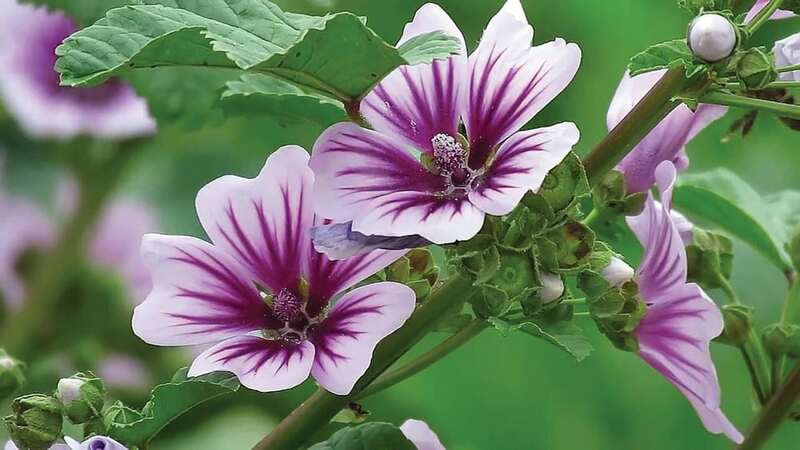 Mallow leaves have a greater symbolic meaning than flowers, symbolizing in Christianity and in many other cultures, the desire for forgiveness. The symbolism of this flower is traced back from the Greek myth of Narcissus, the beautiful youth who fell in love with his own reflection in a river and drowned trying to embrace it. Narcissus symbolizes self-love, selfishness and indifference. After his death, the beautiful young were reborn in the shape of a flower. 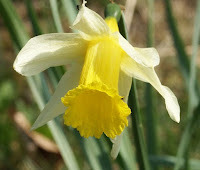 Narcissus is used to symbolize selfishness, the triumph of divine love, sin over death and sacrifice. Narcissus reflex the true sign of the coming spring, when daffodils appear, it is said that bad weather does not return back for a few months, so it is really daffodil flower that heralds spring. In large part, this symbol is linked with trumpet shaped flower which is also its religious symbolism, the flower of the Resurrection. Moreover, the daffodil appears around the holidays of Easter, always announcing the death and resurrection of Jesus and calling people to church in those days. It is an advertisement of judgment and thereby is associated with a perpetual "memento mori". How it was mentioned, Narcissus flower have a contradictory symbolism, a symbol of death, but in the same time a symbol of life, known since ancient times. The violet is the emblem of humility, thus the phrase "shrinking violet". Because of the three characteristic leaves, medieval monks called violets as "flowers of Trinity". Also among the Christians of those times was widespread belief that the violets were, until the day of Jesus' crucifixion, flowers that raised up their calyx with haughty to heaven, after the crucifixion, the shadow of the cross fell upon them, and the flowers bowed their “heads” as a sign of embarrassment to the persecution that has undergone Jesus. 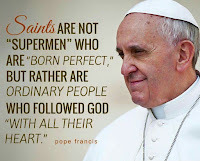 By extension, it refers to the Incarnation of Jesus Christ. 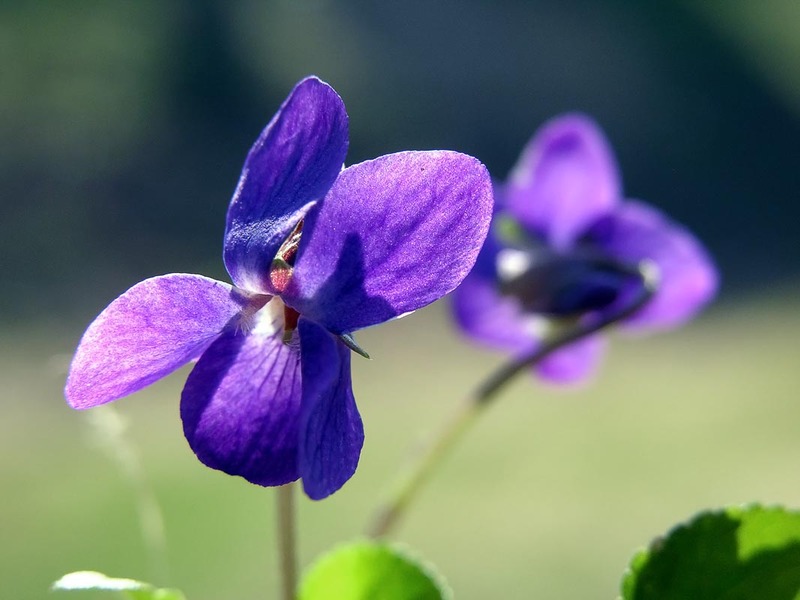 In Christianity and art reflecting the religion, violet is a symbol of modesty and humbleness. In paintings of the Renaissance, the Virgin Mary holding the Jesus child in her arms, is often depicted with purple flowers, signifying her modesty but perhaps as the premonition about the death of Jesus, as in the painting "Madonna and child with flowers" by Leonardo da Vinci. Another artwork in which violets appear in the background is "Madonna of humility" of the artist Giovanni Paolo. These flowers represent the blood of Jesus Christ from the Gethsemane garden and Calvary. 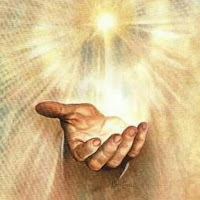 In one of the legends of early Christianity, it relates how a monk stole the hand of a statue depicting the Jesus child. While hiding the monk in the mountains, he lost the way and, before dying of exhaustion and hunger, he buried the stolen treasure. The following year, in the place where the monk had hidden the precious object arouse an orchid, a flower whose roots reproduce exactly a child's hands. 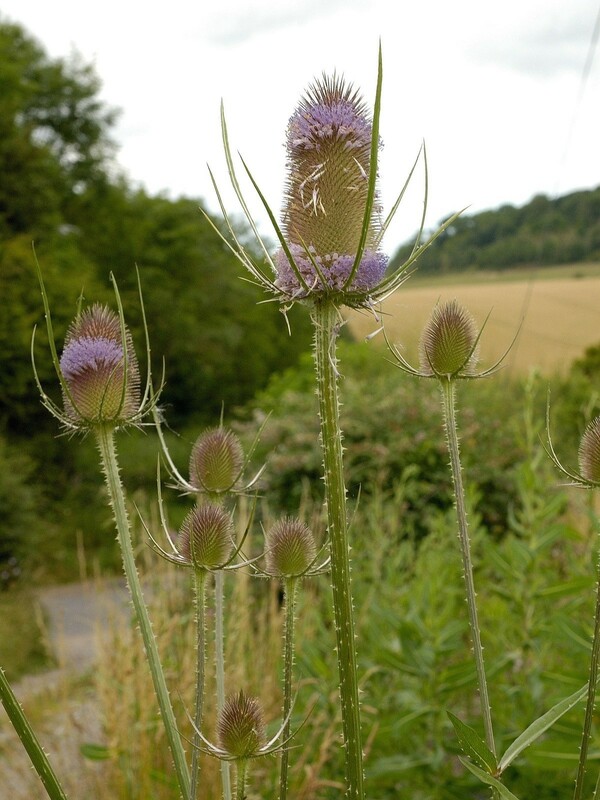 In Christian iconography, the prickly plant teasel is used to symbolize the sufferings of Christ and the martyrs. Its thorny stalks recall Christs suffering under the crown of thorns, the symbol of grief and sorrow (Matt. 27:29; Mark 15:17; John 19:5). 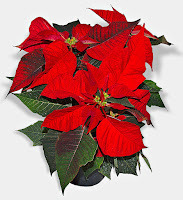 ↷ Poinsettia: It is a symbol of purity. Flower is associated with faith, goodness and trust in people. Other flowers used as religious symbol are: Aloe, Centaurea, Cephalaria, Chrysanthemum, Crocus, Dictamus, Ficus, Fern, Gladiolus, Lathyrus, Lavandula, Philadelphus. Flowers, sacred symbols serve as the evocation of the principles of faith, and faith history. Flowers are powerful tools for crystallization of religious devotion and faithful, elements that help the development and focus of faith. Also, flowers are a form of communication that exceeds international barriers of language, nationality or culture. From immemorial times flowers are bearing symbols. The meanings, the language of flowers have their origins in cultures of early civilization and later also in Christianity. Flowers are part of the most important occasions in people lives. Flowers are constantly present at weddings, baptism, birthdays, funerals and important events, being a piece of people feelings. Nature and revelation testify the love of God. Flowers are some of the most beautiful creations of nature, their colors attract, the widespread fragrance refreshes every human being, and their fluorescence delights every soul. Flowers symbolize beauty and positivity. The flowers have a specific meaning, a symbolism that people unconsciously or consciously respect it, but art communication through flowers is different and sensitive. People give flowers to express nonverbally both love, sense of respect or friendship. Everyone knows that a red rose symbolizes love and it’s not recommended to send yellow roses to a person who is grieving or Lily is a symbol of innocence but also of fertility, of spiritual love, of integrity and of hope, and White lily represent chastity, purity and dignity. Tulip is the flower of femininity. Because of its shape similar to a heart signifies love. 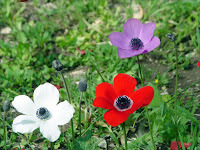 Anemones are the symbol of fragility, suitable for sensitive people. 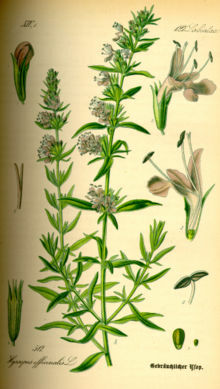 However, meanings are associated not only to this type of flower, but for all. Different flowers are different symbols. Each shade and each flavor has something to say. It is important to know that almost all the flowers have religious significance. Science and religion do not contradict, but complement each other.